Cooped up, overwhelmed, depressed, stuck, under pressure? You are probably breaking one of the fundamental laws of life – balance. Life is equally made up of the yin and yang – that is 50% of yang time – doing, action, willpower, creating, expanding and courage. Compare this to the underutilized 50% of your time being receptive, integrating, relating, nurturing and reflecting. Only in the stillness do we integrate and receive higher perspectives. 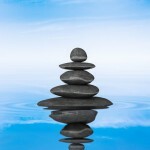 It is in the silence we get creative, intuitive, guidance and strong positive feelings. Align with the ebb and flow, give and take, expansion and contraction of life. Strive for more balance. Trust your inner guidance so you do the right things more wisely. Next post: A journal is your best friend.